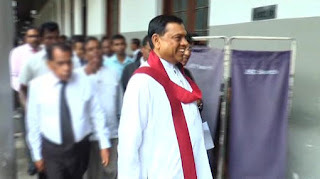 The Colombo High Court decided to postpone the case filed against former Minister Basil Rajapaksa and the Director General of Divi Neguma Department Kithsiri Ranawaka over the misappropriation of public funds through the ‘Divi Neguma’ program until May 04. Rajapaksa and the Divi Neguma DG, for allegedly siphoning Rs 29.4 million from the ‘Divi Neguma’ program to print 50000 almanacs with the face of former President Mahinda Rajapaksa during his election campaign in late 2014. When the case was taken up before Colombo High Court Judge Gihan Kulathunga today (13), the attorney general’s department said that the Court of Appeal had issued an interim injunction effective until March 16, preventing the case from being heard before Justice Gihan Kulathunga. Senior State Counsel Sudarshana de Silva also stated that the petition which has been filed by former Minister Basil Rajapaksa is to be taken up for consideration on March 15. Therefore the High Court postponed the case until May 04. Meanwhile the Court of Appeal today said that the revision petition filed by former Defence Secretary Gotabaya Rajapaksa seeking a court order acquitting himself and the other defendants charged by the Bribery Commission in the Avant Garde case, will be taken up on March 22.